Some people dwell alone, many in family-based households, and an adventuresome few in communes. The Household is the first book to systematically lay bare the internal dynamics of these and other home arrangements. 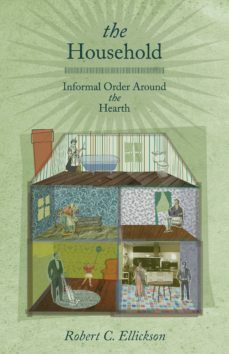 Legal underpinnings, social considerations, and economic constraints all influence how household participants select their homemates and govern their interactions around the hearth. Robert Ellickson applies transaction cost economics, sociological theory, and legal analysis to explore issues such as the sharing of household output, the control of domestic misconduct, and the ownership of dwelling units. Drawing on a broad range of historical and statistical sources, Ellickson contrasts family-based households with the more complex arrangements in medieval English castles, Israeli kibbutzim, and contemporary cohousing communities. He shows that most individuals, when structuring their home relationships, pursue a strategy of consorting with intimates. This, he asserts, facilitates informal coordination and tends ultimately to enhance the quality of domestic interactions. He challenges utopian critics who seek to enlarge the scale of the household and legal advocates who urge household members to rely more on written contracts and lawsuits. Ellickson argues that these commentators fail to appreciate the great advantages in the home setting of informally associating with a handful of trusted intimates.The Household is a must-read for sociologists, economists, lawyers, and anyone interested in the fundamentals of domestic life.